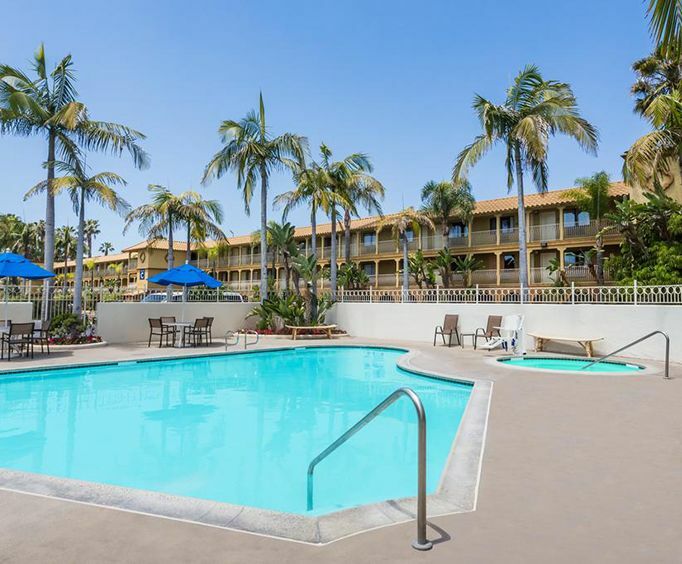 Mission Plaza Hotel and Suites by Sea World is less than a mile away from SeaWorld in San Diego. 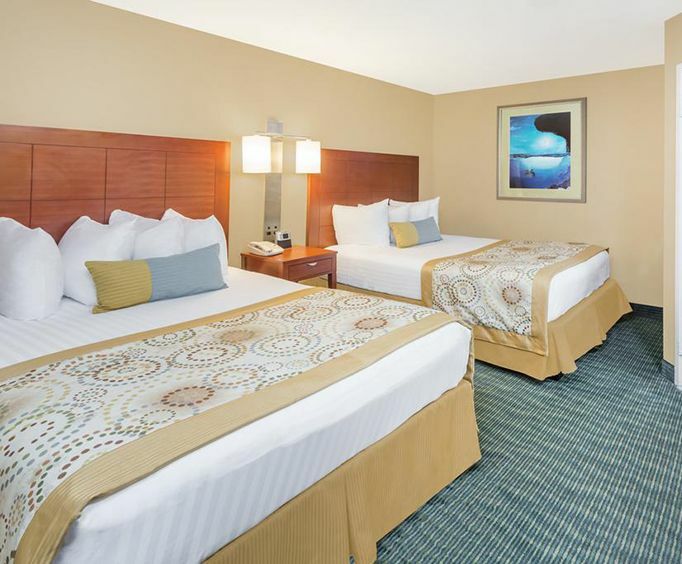 Enjoy the wonderful services and amenities offered by the hotel, including a state-of-the-art fitness center, a heated outdoor pool, a 24-hour business center, free high speed internet access, concierge service, daily newspaper, local calls and an on-site restaurant. 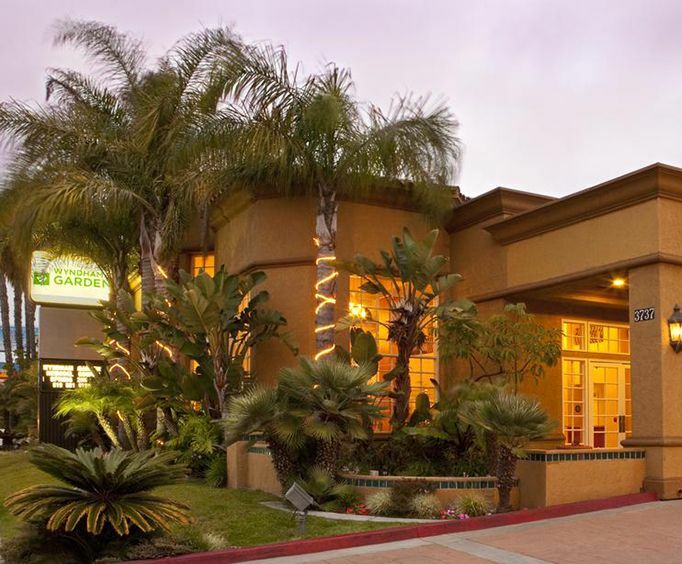 Visit exciting nearby attractions, such as San Diego Zoo, Balboa Park and LEGOLAND, all within 10 miles of the hotel. While you sip your morning coffee, catch up on the day's news with a free daily newspaper. Energize your body with a brisk workout in the on-site fitness center. Treat the family to an animalistic experience at the nearby San Diego Zoo, or spend the day at popular attractions like Legoland. Afterwards, treat yourself to a delicious dinner at the on-site Du-par's Restaurant & Bakery. In the evening, relax under the stars by the outdoor heated pool or take a long soak in the hot tub. While in your suite, have a meal delivered from room service while you relax with cable television or complimentary high speed internet. An iron and ironing board are also included to help you stay looking neat. If you prefer eating away from the hotel, check out Phil's BBQ, Red Lobster or Cafe India, all located within just a few hundred feet of the hotel. Great shopping is only 0.3 miles away at Sports Arena Square Shopping Center. For sports, check out the PetSmart Sports Arena, just 0.6 miles from the hotel. 3 stars because when we showed up they let us check in early and upgraded our room for free. But the restaurant is not really attached to the hotel and it's just dupars. The staff was very nice the managers were grumpy and standoffish. And the whole facility was a bit run down not like the pics. I expected more but it was close to sea world and the zoo. The room was run down, the microwave did not work properly, the fridge did not operate properly. The beds were clean and comfortable, the bathrooms were clean. The staff were helpful and friendly. Security on site. Not worth the money. They had no record, at the front desk, of our prepaid reservation. Somewhere, in the back of their office, someone accessed our reservation & we got our rooms. It was a little scary to arrive & find no one knew we were coming!